Once you have sold a package for a number of sessions it is important to understand how the package balance is calculated. Firstly, to see the balances for a customer's packages go to their client records via the Clients screen. 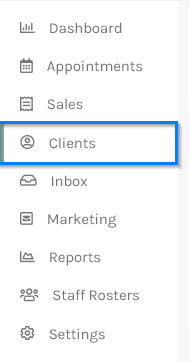 Search for the client and click the record to show their details. When the client is visible you will be able to see in the header how many sessions are remaining available to the client. The basic formula for the balance is very simple, the number of sessions originally sold, less the number of sessions completed, less the number of future sessions booked. So for example, if Mary purchased 10 sessions and used one of those sessions at the time of purchase her balance would be 9. Then a week later she came in and used a second session and also rebooked a third session here balance would be 7, one for the completed and for the booked.